The parents of a pair of children seen on video being handled roughly by employees at a private school in New Jersey earlier this year have filed a lawsuit against the organization that runs the institution, court documents show. The suits are the first to be filed since cellphone videos obtained exclusively by the I-Team, showed teachers manhandling two children at Apple Montessori School in Hoboken. 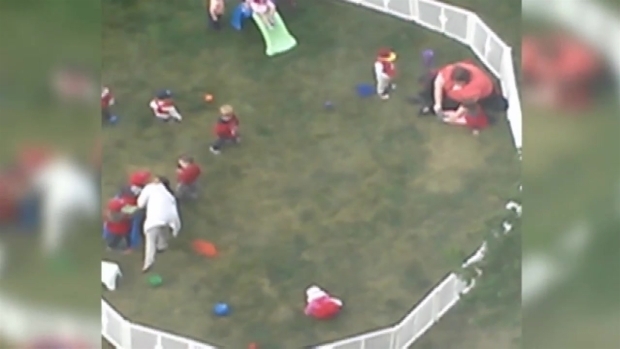 The suit, filed by the parents of the children seen in the video, seeks unspecified damages from Apple Montessori Schools and several employees for negligence, emotional damage, breach of contract, assault and other charges. The videos, obtained in May, showed a series of abusive acts. In one clip, an aide is seen grabbing at a 23-month-old girl as she attempts to put a hat on the child's head. Clearly exasperated, the teacher, Elisabeth Gomez, aggressively picks up the child and pushes her to the ground, leaving her lying there as other children play around here. "Your heart sinks when something like that happens to your child," Brett Stenhouse, the father of one of the children seen in the video, told the I-Team. Another family of a little girl shown in a second video clip, also exclusively obtained by the I-Team, is also suing. That clip shows a teacher, Kelli Dugan, in red sitting and holding a 2-year-old girl by her legs, preventing her from moving freely. The teacher is heard cursing in the video; she yells at the child and eventually swings her over a fence before dragging her back inside. The owners of Apple Montessori declined multiple requests for an interview, but said in a statement to NBC New York that the owners “took immediate and definitive action” and that they have “reviewed and reinforced training” procedures. Both Gomez and Dugan declined to comment. The abuse remains under investigation. After three teachers and two school officials were fired from a New Jersey Montessori school in an investigation of a cellphone video showing an aide aggressively handling a 23-month-old girl, more troubling video of workers at the school has surfaced. Ida Siegal reports. The school held a meeting for parents earlier this year assuring that major policy changes are coming. The owners promised they would install more cameras inside the school, and that parents could access them remotely, according to parents who were at the meeting. They also promised improved communication between the school management, owners and parents. The I-Team first reported in June that Apple Montessori is not licensed by New Jersey. It is also not accredited by the American Montessori Society. It is one of about 600 schools in New Jersey that can care for infants and children, but are not subject to the strict rules and regulations that govern the child care industry. Stenhouse was surprised to learn Apple Montessori is not licensed. “We had no idea, and I think you go to a facility like this and expect they are operating, they are in full public view, they must be licensed,” he said. Lynette Galante, vice president of the New Jersey Child Care Association and owner of the Future Generation Early Learning Center, said parents who take their children to unlicensed facilities are taking a gamble. Galante’s center is licensed and must pass annual health and fire department inspections. "You're making sure the staff-to-child ratio is intact, you're making sure you’re attending a certain amount of staff training, you're making sure healthy procedures are being followed," she said. Experts say that when evaluating a day care facility for your children, ask whether it is a licensed facility, how much training its staff receives, and whether employees are CPR certified. In New Jersey, a licensed day care center should have one caregiver for every six kids. If the kids are younger than 18 months, there should be one caregiver for every four kids. Child care centers licensed in New Jersey can be found on the Department of Children and Families website or by calling the New Jersey Association of Child Care Resource and Referral Agencies at (732) 947-8730. In New York, anywhere outside of the five boroughs, licensed child care providers are listed on the Office of Children and Family Services website. That site is also resource for family day care or group family day care. Within the five boroughs, the NYC Department of Health and Mental Hygiene regulates most child care service providers. The website lists child care programs that are issued permits.